Watch the waves, turtles and whales from our oceanfront living room, private lanai or even while in the kitchen. Unit 227 is the newest of the 2-bedroom units at the Mahina Surf, a low density (only 56 units) oceanfront tropical paradise. When we first started coming to the Mahina Surf in 1990 it truly was “Maui's Best Kept Secret!” Over the years more and more people have discovered the relaxing and uncrowded atmosphere that has kept us coming back year after year. Unit 227 was built to our specifications including extra wide inside unit stairs to make getting your luggage upstairs easier, wired smoke detectors in each bedroom with battery backup, wall mirror in the front room to fully capture the ocean views, sleeping for six, Moen kitchen and bathroom facets, two walk-in tiled showers, main floor fully tiled, stone kitchen and bathroom counter top, new kitchen appliances, and Hawaiian decor. We have two bedrooms and two bathrooms. The main floor bedroom has a King sized bed. The second floor loft bedroom has one Queen and one Twin sized beds. We have a Queen sized sofa sleeper in the living room. Both bedrooms and the living room all have attractive and quiet ceiling fans. Both bathrooms have ceiling fans as well. The kitchen is perhaps the best room in our unit with direct ocean front views of the waves and blue ocean. The dish washer is so quiet we thought it wasn't working when we first used it! The kitchen is fully equipped and has many helpful items we don't even have at home. The tropical patterned dishes came from Macy's as did the flatware and knife set. The beautiful Silestone quartz counter tops in the kitchen and the bathrooms offer protection from bacteria, scratches and stains. We are just a short walk away from Kahana beach. 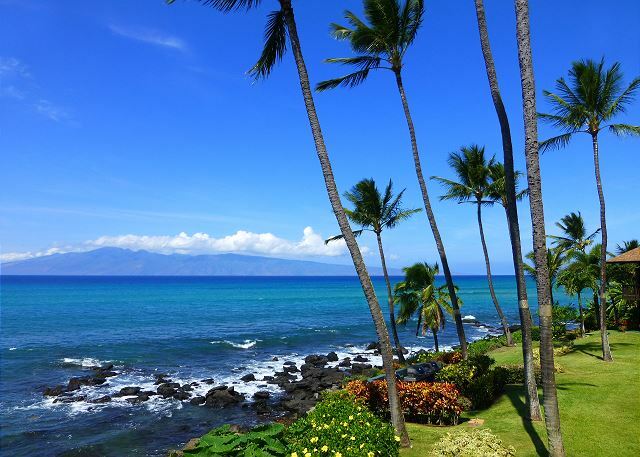 The beautiful beaches of Kapalua (our favorite) or Kaanapali are just a few minutes drive to the north or south of the Mahina Surf. Great snorkeling directly at the Mahina Surf oceanfront or at Kapalua and just a little further north at Mokuleia Bay (Slaughterhouse Beach) near mile marker 32 and Honolua Bay near mile marker 33. Great boogie boarding when the waves are up at Slaughterhouse! Fun dining opportunities in Lahaina on Front Street. We like Kimo's and Cheeseburgers in Paradise. The Hula Pie at Kimo's is worth going in for even without dinner. At Whaler's village we love Leilani's On the Beach. We eat outside. Sister restaurant to Kimo's, they also have Hula Pie. Hula Pie is made with a favorite macadamia nut ice cream piled high on a chocolate Oreo cookie crust and topped with chocolate fudge, whipped cream, and more macadamia nuts. China Boat is a short distance north of the Mahina Surf for excellent Chinese food. The best fresh fish food dinning experience on our side of the island is at Pineapple Grill in the Kapalua Resort. Many beautiful golf courses await you just a few minutes away in Kapalua or Kaanapali. Maui is endless in its beauty and opportunities for adventure that await your next visit to The Valley Isle, voted “Best Island” by readers of Conde Nast Traveler for nineteen years! So welcome to our home in Maui! We love it and hope we can spend more time here in the years to come. The location is perfect and the views of the whales, other islands and ocean activities unsurpassed. We saw whales from the lanai! 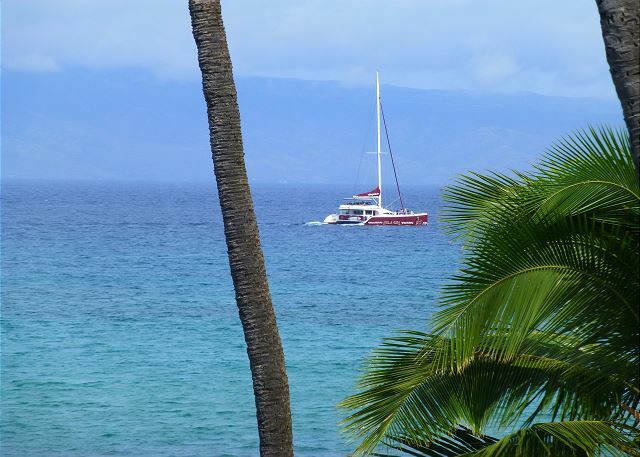 Marina Surf is an idealistic location on Maui for peace and quiet. This unit has a great view of the ocean, and yes, we saw whales from the lanai! Wish we could stay longer and look forward to our next vacation! Our accommodations at the Mahina Surf were perfect for 2 adults and 2 teenagers! We saw the sea turtles sleeping on the beach (about 10 of them!). The Condos were about an hour from the main airport but once we got there we found plenty to do. I rented unit 227 and it was amazing. I always love my stay at the oceanfront Mahina Surf Condos. I find it very difficult to even consider looking to stay anywhere else in Maui besides here. I have been coming here for so many years that it actually feels like my home. I've stayed at Mahina Surf several times and absolutely love it! It's complex is small enough to be friendly and the condos big enough to be home. The view is incredible and there's no reason to leave, except to eat at one of the nearby restaurants to shop the galleries. Great new find for me. Perfect location. Beautiful grounds and perfect amount of space in the condo. Rained almost every day but who cares, I'm in Hawaii! 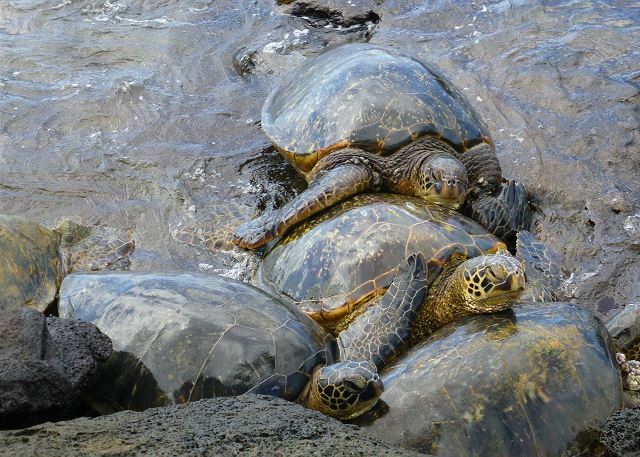 I have been to Hawaii before and never saw a sea turtle. At this place, it was hard not to see them. They were everywhere. On the beaches, just off the surf, on the rocks and were not afraid of you when snorkeling. I was surprised how they could sneak up on you if you weren't paying attention. They weren't aggressive, just pretty friendly. I know not to touch them but they will touch you. Great vacation. Hawaii is the most relaxing place I have ever been and the Mahina Surf will be my new stay when I come. Bed needs replacing , needed physio after our stay . Great unit to share with my daughter and her family - Husband, 13, 11,and 3 year old. Plenty of room and great views from the deck.